Are you planning a little mountain vacation? Don’t leave home without cookies! 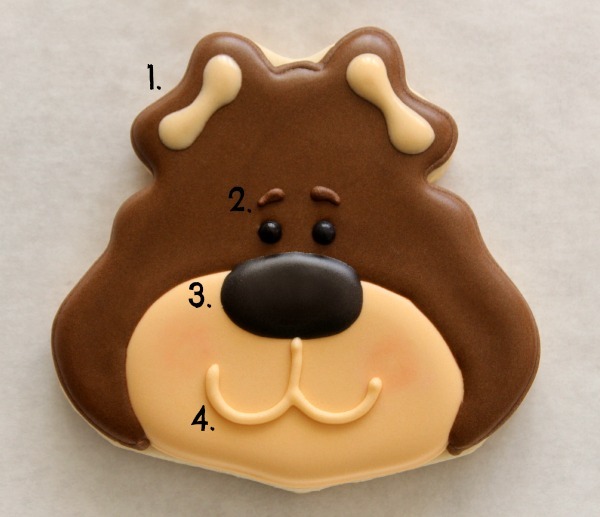 These decorated brown bear cookies are the perfect snack for your next cabin retreat. While the rest of the world is turning frogs into princes, I’m transforming them to bears. 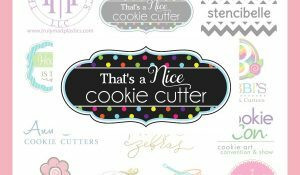 All it takes is a little sketching…and this cutter, if it’s not already in your collection. Begin by outlining the cookie as pictured below. 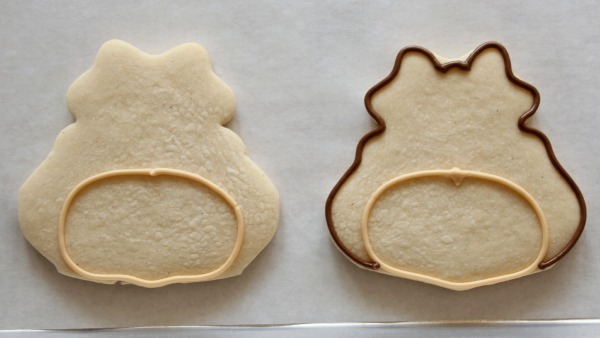 If necessary, use a food safe marker to mark the cookie before piping. Next, fill each section. Give the ivory a bit of time to dry before moving on to the brown. This will prevent bleeding. While the brown icing is still wet, use tweezers to drop on sugar pearl eyes. 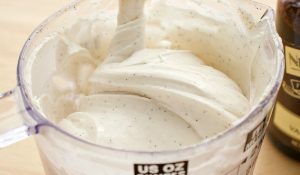 I do this to save time when I don’t want to mix another icing color. If you don’t have sugar pearls, use regular black icing. Let the base dry completely…this can take anywhere from four to twenty-four hours, depending on where you live. To add interest, use a clean cotton swab to apply a tiny bit of color to the cheeks. Since I don’t like lonely cookies, I threw in a few other designs. I’m pretty sure my brown bear is right at home in his little cookie forest. Super cute! This set would be perfect for my Canadian uncle…especially that moose! WOWSERS! Those are amazing and beautiful! The checkered cookies are incredible! How flippin’ cute are these?! And those red checked cookies… FAB set! LOVE these so much. You are brilliant. 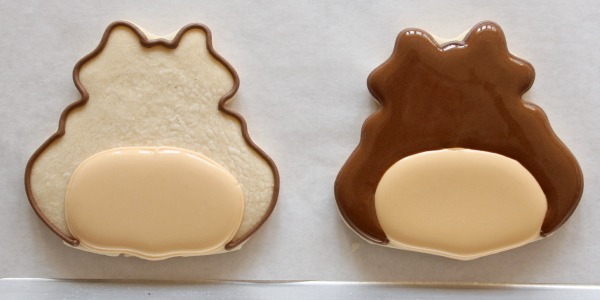 The simplicity you bring to complicated cookie decorating is amazing. 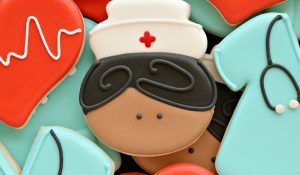 With love…..
Super cute cookies! You always make it look so easy. Quick question…what do you use for the rosy cheeks? These are so cute! I love how many ways you have used this frog cutter now! And the log slices are genius! Your buffalo laid is perfect, I really cold have used that stencil a few months ago! HEADSLAP! I knew I missed a link! These are just adorable! I have just started to get into the cookie decorating as a hobby. I love your website. I do have one question: Did you use a moose cookie cutter or is this a cookie cutter that was turned upside down . . .like the baby cookie cutter or a gingerbread one? I would like to try these for my sister’s 50th birthday. Do you have something that shows how to make the rest of the cookies? Thanks and they are AMAZING!! 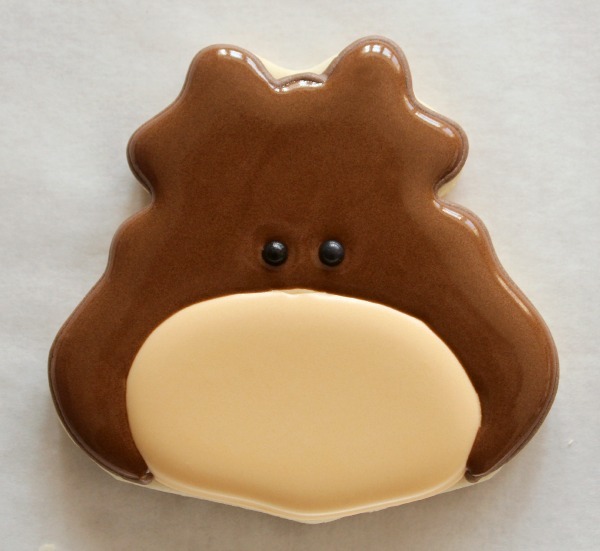 I’ll try to post the moose cookies soon, if my body will cooperate, lol! 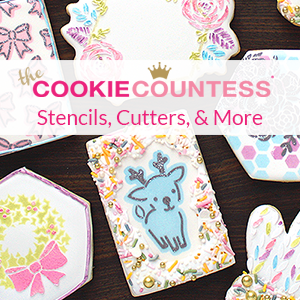 Hate to run, but now I have to purchase another stencil from the Cookie Countess! I’m ADDICTED! Her shop is the best thing that’s happened to me cookie-wise in a LONG TIME!!! This is one bear I wouldn’t mind running into in the woods. He’s adorable! Love them they are adorable! First the polar bear, then the skunk and now the bear!!!!! Maybe there are others that I haven’t seen yet! Have you ever done a frog with the frog cutter? Ohmygosh!! 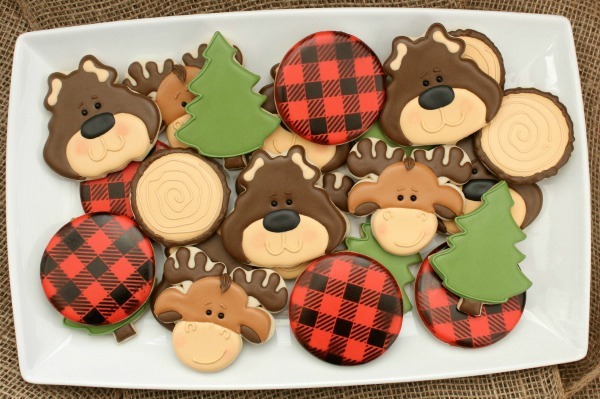 Cutest cabin cookies! I’m so loving that wood slice!!! You are so creative. I love the sugar pearls for the eyes!! Cute little bears! The moose are cute, too. Thank you for being such a great teacher and sharing your knowledge with us. 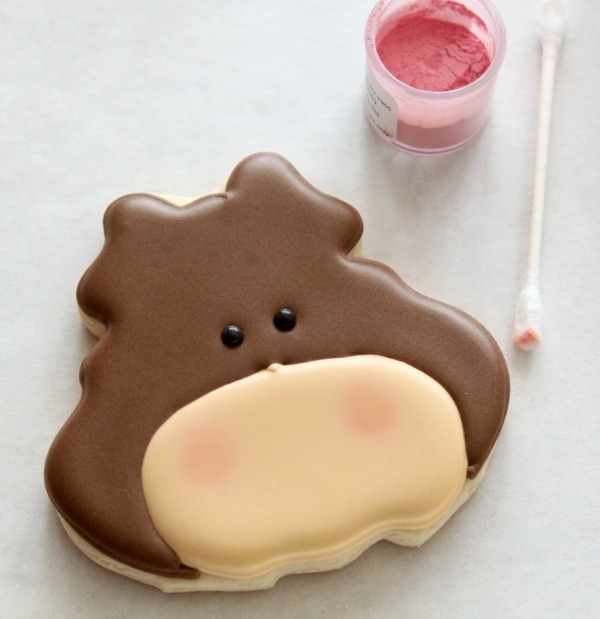 OMG – I love the moose cookies! My husband and I just got married in November, and our pet name for each other is “Moose”. (I honestly don’t even remember why. These made my heart all warm and fuzzy! These are totally cute!!! I love the red and black plaid lumberjack accent. You are so clever to put this all together!!! What an adorable set! Couldn’t be any more perfect, Callye! I love the tree trunk slice and the fabric swatch! I do know of someone who is planning a mountain vacation and these would for sure be the best surprise send off gift! I love the plaid cookies, so glad they’re part of the forest! Good job. You’re very creative and inventive. One can definitely learn a lot from your technique, directions, and pictures. Thank you. I have to get that frog cutter! but the possibilites are endless as you have shown with the skunk, polar bear, & now this cute guy! Can’t wait to see the tutorial on the moose. Could that be a gingerbread man hiding under there? Como devo proceder aguardo ansiosa pelo seu retorno. OK, I was just thinking that I have way too many cutters but now I see there’s one I still NEED. These are so freaking adorable! I can never get over how creative you are with cutters. I have the hardest time visualizing them as anything other than their intended use. Amazing!! And that plaid cookie is awesome. I tried to get the stencil but the link says they’re no longer available. 🙁 Can you please do a tutorial on how to do a plaid or even a gingham cookie? I can’t figure it out. I Love how perfectly they all go together! That plaid stencil is Awesome! And the little tree trunk cookies- perfect!! Awesome set! Woww. Its lovely. Thanks for sharing..
Amazing! I love the buffalo plaid stencil – I would love to learn more about stenciling techniques so will check out your other posts. Thank you! do you sell your cookies I want to buy these!! How did you make the log cookie? what is around the outside? 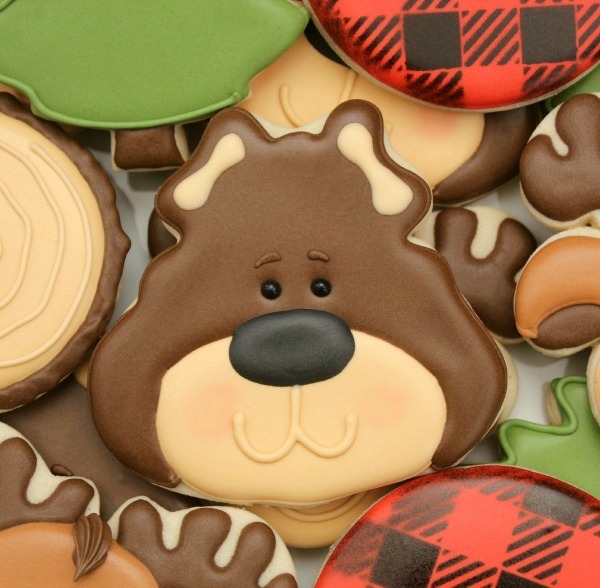 What cookie cutter did you use for the logs and the moose? 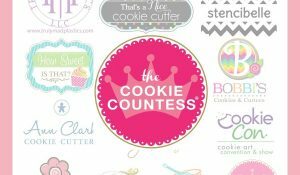 Your cookies are amazing, I am trying make this set of cookies for my son’s first birthday in March!